Relax with the all new 2 Person Noodler Lounge. Cool off, kick back and enjoy the comfort mesh seating while utilizing the built in cup holder to holster your favorite beverage. You can also flip the Noodler over and have a custom belly board to splash up some fun with! 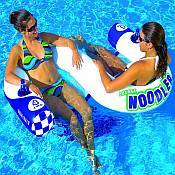 If you want relaxation at the pool, beach, or lake, then the Noodler Lounge is your ticket to serenity.